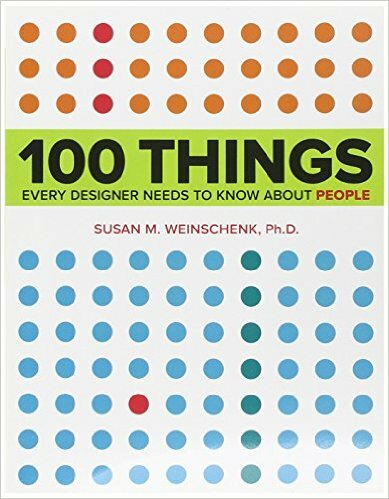 In this book, Susan Weinschenk explores 100 principles from psychology, sociology, and technology that are helpful for designers to know. The book is broken out into chapters that cover topics such as decision-making, thought process, and attention. Each of the 100 things provides a quick summary of research done about the topic, and how it can apply in the world of design. “People remember only four items at once.” This was a big surprise as we were reading about human memory. We’re used to discussing short-term memory in terms of the common seven plus or minus two rule, but research is showing that short-term memory is even more limited than previously thought. While it appears that this limits us further, what Weinschenk discusses is that chunking information into four pieces is another way to help manage short-term memory. “People process information best in story form.” While storytelling is a familiar concept for designers, it may not be as well-known how helpful storytelling can be for processing information. Through using stories, it’s easier not only to connect to users emotionally, but also provides a way for them to process information quickly while also leaving a lasting impression. Learning that there is a scientific basis for this principle was a big lesson for us! “People make predictable types of errors.” This statement was unsurprising to the designers, but what was helpful was seeing a breakdown of types of errors that users can make. For example, a commission error is one where a user takes additional unnecessary steps. Having these additional error types will help us to evaluate user behavior better. A big discussion towards the end of the book was around the need to create illusions through design. For example, Weinschenk explains that “people want more choices and information than they can process” and “people think choice equals control.” We discussed the impact of these statements and as designers how we need to create an illusion of control for the user. How do we offer them enough choices to make them feel in control without giving them everything they think they need? There’s a clear balance that must be discussed during a project to support decision-making. Between sections, we saw a lot of patterns around the social aspect of experience design, particularly in imagery and stories. We read “anecdotes persuade more than data” and “people are hard-wired for imitation and empathy.” This reinforced why having stories from users, for example patient stories, with key imagery that shows a person’s face can help users connect on an emotional level. We know that “mood influences the decision-making process,” so creating this social and emotional bond could influence how users make decisions. At the highest level, we appreciated this book’s attempt at providing quick summaries on research about how people think, behave, socialize, etc. and relate it to how it applies to design. Our biggest takeaway is that people behave in a predictable pattern, but their decision-making is more unconscious and irrational. “100 Things Every Designer Needs to Know about People” is not only a great read, but also an excellent resource for designers to go back to the foundation of design principles and heuristics. This solidifies what we know about people and understand the underlying research around human behavior, thinking, and decision-making.